Machines for the packaging industry and packaking materials | INDUSTRIAL MACHINERY Ltd.
We provide reliable and affordable machines for every business, including expert assistance in training, financing, or leasing. We are a company with clear ownership relationships, we pay attention to compliance with applicable standards, contracts and regulations, we pay taxes. We have our own production capacities, including the possibility to produce customized packaging materials according to the customer's order. 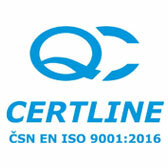 We are holders of the CSN EN ISO 9001: 2016 certificate, we have been awarded the "Reliable Company" award for many years, and other awards such as the Graduate Companies Register 2015, TOP rating 2014, AA rating 2013, Dynamic company 2013 from rating company Bisnode, etc. Welcome to the website of INDUSTRIAL MACHINERY Ltd.
INDUSTRIAL MACHINERY Ltd. was founded at the end of 2005. Our core business is the production, import, assembly, sale and service of machines for the packaging industry and the manufacture, import and sale of packaging materials.